A year ago I was so disappointed when it didn't pan out for me to become a Mini stockist of Annie Sloan chalk paint. I approach things with a positive attitude and I knew that something better was going to come along. I had no idea it was going to be this good - Yep I'm so excited! Why you ask? The person behind all my excitement is a lady by the name of Kathy Van Gogh. 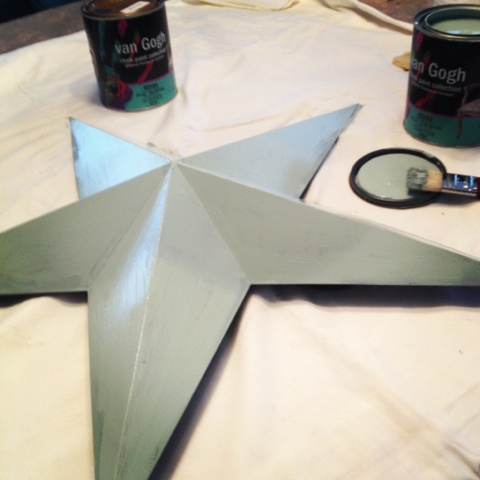 Kathy is a decorative painter who has launched her own line of chalk paints manufactured right here in Canada. I am thrilled and honoured to become the Ontario distributor of Kathy's fabulous paints. I have started playing around with the paint on some of my own projects, I'll soon have a website launched for online sales but I'm also looking to assist Ontario retailers who would like to sell this paint and host workshops in their stores. 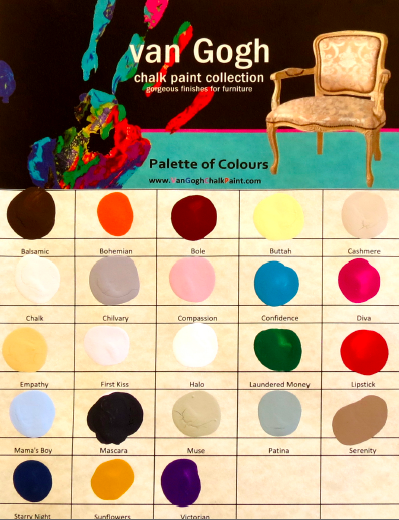 Following is the chart with available colours in van Gogh Chalk Paint, I will be working on some hand painted swatches that I will share once they are complete. This week I cracked open the paint to do a couple of small projects. 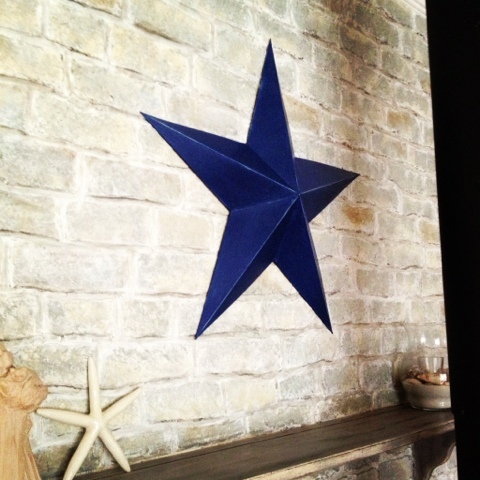 I repainted my mantle shelf, painted my barn star and did a little 2 sided sign for the mantle shelf. 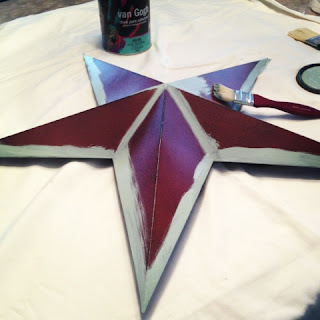 I love that this paint sticks to all surfaces without priming! Here it is complete, with a coat of Starry Night over the Patina then I rubbed a damp cloth over the edges to expose the Patina coat, once completely dry I gave it a clear top coat. I'm going to show you the sign I made in another post - stay tuned! Jo... I am so excited to hear that you are stocking this paint in Ontario. I have seen the name around but again, trying to find it is another story. I will investigate this further now. I love that they have the wax too. I refuse to pay the fee for AS paint and supplies. Good luck with your new venture, I am sure you will do well. Oh my goodness, you are following your heart and doing what you love and I'm so excited for you, very very envious! Now I know where to go when I need some chalk paint. I know you are going to be successful! JoJO, I LOVE that colour combo! I've actually never done that one. You've inspired me - I'm going to go paint something in it! For all you other creative people out there that are also inspired by JoJo, connect with her - she will help you become a retailer in Ontario. Thanks for visiting my blog today so that I could find yours :) And congratulations (although I realize this is not a new post)! !